Experience one of the seven natural wonders of the world on this guided, full-day, small-group tour from Las Vegas. Travel through the Mojave Desert and Black Mountains en route to the Grand Canyon’s West Rim for 4-hours to explore. You can upgrade to see the canyon from the air on a helicopter flight through the canyon or take a walk on the glass-bottomed Grand Canyon Skywalk. A snack, lunch, bottled water and hotel pickup and drop-off are included. Upgrade to take an exhilarating helicopter flight down to the canyon floor. This sightseeing tour to the Grand Canyon begins with a hotel pickup in Las Vegas. Enjoy a light morning snack while making the 2-hour drive east, passing through the Mojave Desert and the Black Mountains and Grand Wash Cliffs of Arizona along the way. Enjoy four hours exploring at the West Rim, with short hikes to the Eagle Point and Guano Point overlooks to take in the amazing views. Also visit the Hualapai Ranch for a delicious barbeque lunch. You can upgrade your tour to include either a helicopter flight or admission to the Grand Canyon Skywalk. Helicopter Option: Lift off high above the canyon in a helicopter, then swoop down between its walls and land on a private bluff just above the canyon floor. Walk around and get an up-close look at the many layers of the interior of the canyon and gain an even greater appreciation of the immensity of this natural wonder. Total tour time is approximately 55 minutes (15 minute roundtrip flight and 40 minutes on the ground). Skywalk Option: Take a walk on the world famous glass bridge that overlooks the magnificent Colorado River 4,000 feet below you. This jaw-dropping perspective will help you gain a better appreciation of the canyon's staggering dimensions. This day tour also includes a complimentary photo stop at Hoover Dam, either before or after visiting the Grand Canyon. Please note: If you have selected the helicopter option, you must provide all passengers' individual body weights. If helicopter option is not selected, please enter 'Not Applicable' in the Passenger Weight field at checkout. If helicopter option is not selected, please enter 'Not Applicable' in the Passenger Weight field at checkout. 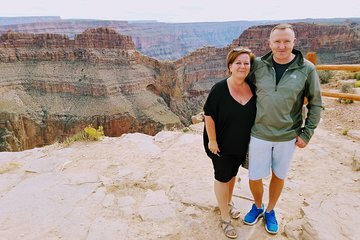 The trip to Grand canyon West was better than I thought. I had been to the canyon by Helicopter last time I was in Vegas. That was really awesome. but I really got an up close and personal this time. We were at the Canyon for a longer time, and we were able to really get the feel for how expansive the grand Canyon actually is. The small group was the way to go, as we all got along and there were no disagreements on the time schedule. We all did our own thing, and were never rushed. It is a long day, so be prepared. it was so worth it. It was certainly a trip we will remember for the rest of our lives. Greg our guild was a book of info, and was willing to share everything he could. Also, he was a good driver, with a great personality. All in all I highly recommend this trip. It was AMAZING... !!! Thank you Greg, for a Wonderful and memorable trip. We have a wonderful guide who was fun, very knowledgeable and gave us ample breaks during the trip.